In 2002, Pat Schwartz was brainstorming with Writers & Books staff person, Kathy Pottetti, about courses, programs, or other events that might draw more attention to the Gell Center. Pat suggested a poetry festival where local writers could dispel the myth of poetry being an obtuse cerebral activity enjoyed solely by academics. Her concept was to have a forum where poetry could be performed with energy, enthusiasm, and healing, while allowing participants to enjoy the inspiring summer environment of the Bristol Hills. Kathy suggested adding folk music. Thus, the First Annual Summer Gell Center Poetry and Music Festival was born. Regional poets and folk musicians gathered together in the Gleason Lodge for an all-day affair that July. After the first year, flutes, guitars, and drums were set aside in order to focus more attention on the music of poetry. 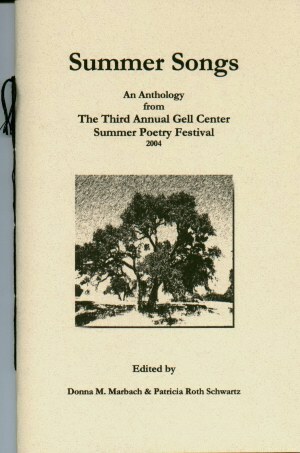 And for the next two years, the event became simply the Annual Summer Gell Center Poetry Festival. This collection is a sampling of the poems read at the 2004 Festival. It was written by published and non-published poets, academics, retirees, doctors, housecleaners, booksellers, counselors, herbalists, equestrians, and more. All are ordinary and extraordinary people. The authors of Summer Songs show the diversity of form, subject matter, and voice of the talented poets who gather at this annual literary event. Summer Songs is a 40 page hand-sewn chapbook.